It’s often the hardest situation in life that brings out the strongest side of us. And this six-year-old child in China has shown great tenacity after a horrific traffic accident changed the fate of her family for good. Little Jia Jia’s father was left paralyzed in the car accident two years ago and her mother abandoned them afterward. 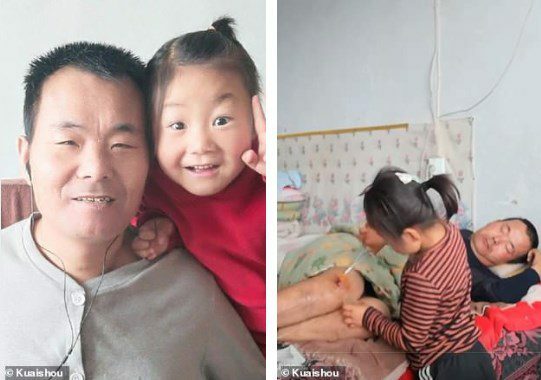 Faced with the tough situation, the tiny girl started to look after her bedbound father in their home in Ningxia Province despite the fact that she was just a young child. According to Chinese media, Jia Jia gets up at 6 am every morning to massage his father’s muscles for half an hour. She also makes sure she brushes his teeth and washes his face before she goes to school. 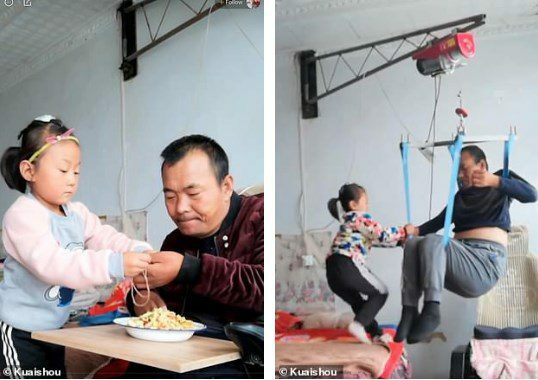 After she returns home, she feeds her father dinner and assists him in moving around the house – using a home-made mobility hoist. When she is at school, his elderly grandparents, both farmers, mind her father. ‘Looking after my dad, I don’t feel tired at all,’ said the girl to a reporter from Yangtze Evening News, shared by People’s Daily Online. Jia Jia’s father, 40-year-old Tian Haicheng, was left paralyzed from the chest down in March 2016, after a taxi he took crashed into a ditch at a high speed, Yangzi Evening News reported. Two and a half months later, his wife of seven years suddenly abandoned him – bringing their eldest son with her. ‘She told me on the day that she was going to stay in her mother’s home for a few days. But she never returned, and she took our son with her,’ Mr. Tian told the reporter. Mr. Tian said he still hadn’t managed to meet his wife and they still hadn’t divorced. Jia Jia has become the pillar of her family since the age of four. Mr. Tian is grateful to his daughter for what she does, adding ‘she is my hands’. He said the most difficult task for his daughter is to move him around the house and help him turn over in bed – because he is so much heavier than her. 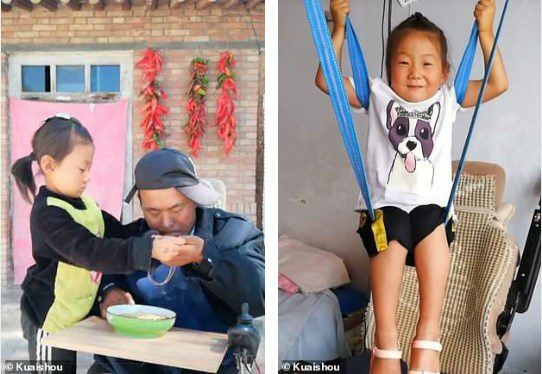 Jia Jia’s grandfather made a mobility hoist using parts he had bought from a hardware shop, and Jia Jia has to use all her strength each time to help her father move from the bed to the wheelchair. 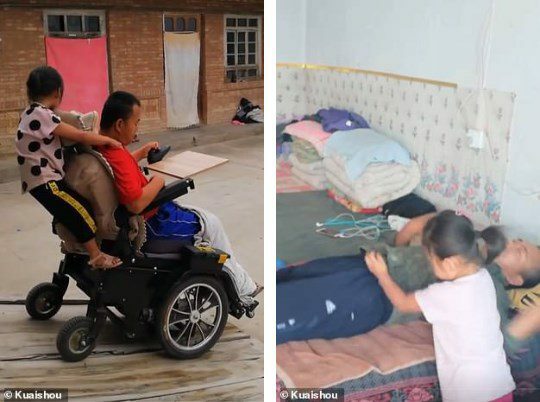 She has to first attach Mr. Tian to the straps of the hoist while he lies in bed, then slowly lifts him up with the hoist and pushes him towards his wheelchair which is by the bed. Lastly, she has to lower him carefully until he sits securely in the wheelchair before removing straps from him. To complete the daily task, Jia Jia must jump on and off the bed multiple times and balance herself carefully so that she doesn’t fall. And apparently, helping her father shave his beard is what Jia Jia does the best. The girl said: ‘At the beginning, I didn’t know how to shave and I cut dad’s face and it bled. But dad said it wasn’t painful. Mr. Tian has had to rely on his parent’s farming income to pay for his living and medical expenses after he lost his ability to work. In order to find more financial support, he set up an account on Kuaishou, one of China’s live-streaming apps, to broadcast his life, hoping to get help from kind strangers. His account, which shows how Jia Jia takes care of him every day, has gained nearly 480,000 followers. The public has been touched by the girl’s strong will, dedication, and courage. They call her ‘a little angel’.